A journal of living with a Flash 10 for the first year by a respected member (ex-Chairman) of the UK Caravan Writers Guild. When we chose to downsize our 8-metre Carthago to a seemingly compact 5.99 metres, we did so with some trepidation. How would we cope without our sprawling luxury and assortment of extras that provided so much comfort? Some say that size matters. Others may say that small is beautiful. Ironically we have found that both apply to our current choice of motorhome. 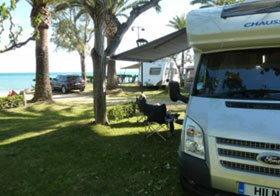 We have now owned our Chausson Flash 10 motorhome for a year. In that time we have found ourselves ‘growing’ into it to the point that we cannot imagine wanting to upsize ever again. You may ask how this could be. 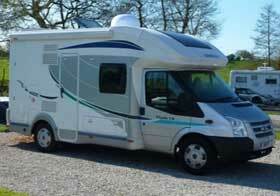 Well, Chausson have managed to create, in our minds, the ultimate ‘Tardis’. Over the previous fifteen years we were regular visitors to Lowdhams in Nottingham and at the shows. It was at one of the shows that we first saw our dream motorhome –a Carthago M-Liner 52 complete with, of all things, salmon pink upholstery! Nevertheless, we had fallen in love and vowed that one day we too would own one. Realising we would have to build up to a Carthago, Steve took the opportunity to suggest an ideal step up from our then Mobilvetta Euroyacht 75 – the newly styled Laika 720. With the help of Matt Greening we were soon proud owners of Italy’s latest concept. It took a further four years before we achieved our dream and took delivery of our Carthago I51 KRH motorhome equipped with all bells and whistles. We had found our ideal ‘home’ to grow old in. However, three years later personal health issues dictated that she had to go. Once again Steve stepped in and, while I was still in hospital, arranged the collection of our pride and joy and organised its sale…..and the proceeds certainly put a smile on our faces. Initially we thought our motorhoming days were over. That is until we paid our friends at Lowdhams a visit at the Peterborough Show. The idea of downsizing to something more manageable for both of us became an option. We looked at several contenders but couldn’t make a final decision. Then, the following weekend, we made an impulsive phone call to Matt at Lowdhams and arranged to buy a Dethleffs Eurostyle T58 low profile motorhome. 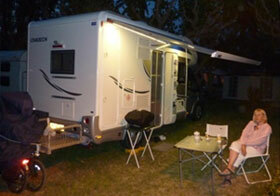 Despite a dubious prognosis we were continuing our beloved camping lifestyle! Sadly the old idiom, ‘Act in Haste, Repent at Leisure’ soon became apparent with my needs. Our new motorhome had to be changed. But what would fit the bill within the constraints of a sub 6-metre motorhome? The Flash 10 was launched at the NEC show, Birmingham, in October 2011 and created a lot of interest both within the industry and amongst prospective owners. No sooner had we arrived at the show than Steve Sharpe of Lowdhams approached us and suggested we view Chausson’s latest offerings. He knew the layout of our ‘interim’ sub 6-metre motorhome was not to our liking and, ever mindful of his customers’ needs, he had sourced ‘the Perfect Motorhome’ for us. And with the previous three being supplied by them we didn’t hesitate in taking a quick look. That was it. We were hooked and immediately started planning how the new layout could work for us. 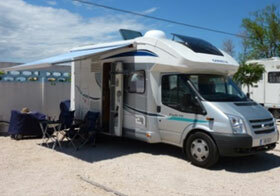 We took delivery of our new Chausson Flash 10 in March 2012. Our choice proved to be well founded as the Flash 10 achieved numerous industry awards during 2012, including ‘Best Budget Buy’, ‘Compact Coachbuilt of the Year’ and ‘Motorhome of the Year’! So, what has Chausson done to create such an all-rounder? Based on the Euro V Ford Transit we chose the 125bhp model (there’s an upgrade to 140bhp). Externally the Flash 10 looks very compact, aerodynamic and good looking. Step inside and a real treat awaits you. The offside door leads directly mid-way between the lounge and kitchen and immediately impresses with its light and airy feel and space! With the electric bed safely housed in the ceiling area, the lounge boasts an ‘L’ shaped seat, two-seat sofa opposite and twin swivel cab chairs. There is enough room for eight people to sit…and eat. Look to the left and there is a well-designed kitchen with sufficient cupboards and drawers to suit most. Opposite the kitchen is the 145litre fridge/freezer with a gas grill above (a combined oven/grill would be more useful) and storage below and above. Move towards the rear and there is a full-width bathroom boasting one of the finest separate showers we have experienced. A large wardrobe is located behind the toilet which we have supplemented by using the top half of the ski locker as a second wardrobe. With such a compact motorhome space is obviously at a premium. This has led to a few limitations in space and specification which are definitely not insurmountable and still represents excellent value for money. The first modification was to have Armitages supply and fit an aluminium rear platform fitted to accommodate our folding electric bikes and my mobility scooter/wheelchair. It also houses a permanently located Honda 1kw generator when additional power is needed. The end result is a work of art and, as a bonus, incorporates a stainless steel bumper bar and tow ball. The entire platform can also be removed at will. We also took the opportunity to fit a Maxview ‘Dome’ satellite dish which has proven to be so easy to use – anywhere. As there is only one leisure battery supplied we chose to fit a Solar Solutions 130 watt panel which has proven to be more than capable of keeping the battery topped up. Another limitation is the provision of only one large gas bottle. We chose to fit a Gaslow refillable cylinder which can be topped up anywhere in the UK and Europe. We have never had a problem with low gas levels even when at a ski resort in Austria. The excellent Truma water boiler is only supplied powered by gas, so we decided to upgrade to the Truma Ultrastore with both gas and electric power. Even in the coldest of climates it has proven to be excellent with a choice of 50-70 degree heat settings. To keep us on the straight and narrow we also fitted a Snooper AVN S9000 double-din radio/CD/DVD/SatNav. This superb unit is programmed with our motorhome’s length, width, height and weight so that we are never taken on unsuitable roads. We have travelled thousands of miles throughout the UK and Europe and it has never let us down. As most new motorhomes are supplied without a spare wheel we have also fitted a Tyre Pressure Monitor to keep an eye on pressures whilst on our travels. 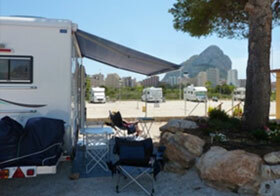 Externally the pièce de résistance is the amazing Dometic Premium Awning complete with LEDs within the support bars. 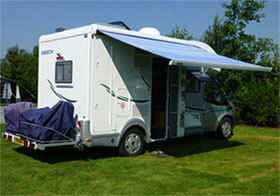 Being electrically operated it takes away all the hassle of manually winding the awning in and out. It also comes without support legs which mean it can be opened as little or much as needed. And if the wind decides to prove too much, it also has a wind sensor that rewinds the awning automatically. A little tweak we have discovered is teaching the bed’s control unit to allow us to lower the bed almost onto the seating making it easy it use without the need for a ladder. And finally, we have supplemented the existing LED lights with units by the entrance door and for reading when the bed is down. On the road our Flash 10 drives like a car even to the extent of having its own ‘sunroof’ in the form of the overcab Heki. With a 6-speed gearbox, high gearing and cruise control both Anne and I have really enjoyed the driving experience. Being less than 6metres in length it is also very easy to manoeuvre and park. Overall, we have nothing but praise for our Flash 10 which has performed faultlessly and provided us with so much enjoyment on our numerous travels. We would certainly not hesitate in recommending this model to anyone.